In the same calendar year where La La Land took home a variety of Oscars, it seemed somewhat inevitable we’d be treated to more musicals in the coming months. One of which is Michael Gracey’s The Greatest Showman, presenting a fantastical, somewhat contrived take on the life of P.T. Barnum. Hugh Jackman takes on the aforementioned role, of the idealist who wants to make money and provide for her wife Charity (Michelle Williams) and two young daughter. With a wild imagination, and inclination to pursue his dreams, the man came from some humble beginnings decides to open up a museum that celebrates the weird and the wonderful, though it’s not giving him any success. 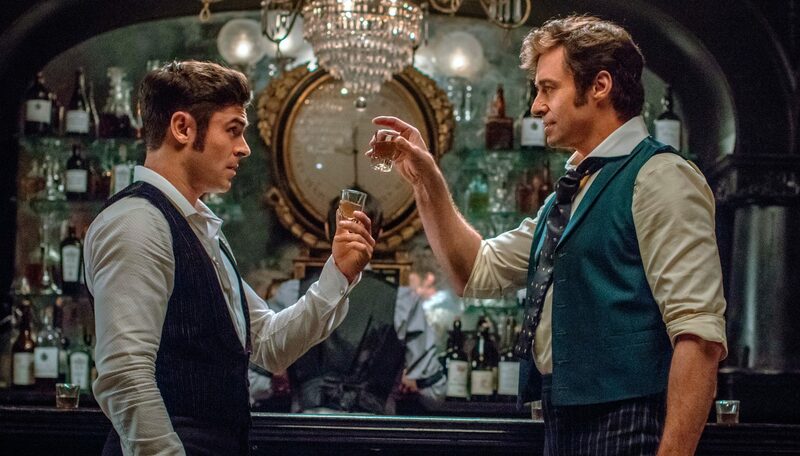 So he decides to scrap the stuffed animals and seek actual human beings, some with physical deformities, others who are just very talented in the art of performance – such as Phillip Carlyle (Zac Efron) and Anne Wheeler (Zendaya), and he opens up his circus – and it’s a spectacle that brings in punters from all over the nation. First and foremost, and it’s a rather big issue considering the genre this title sits within, is that the music is really bad. It feels like such a missed opportunity to thrive in the soundtrack of the era the tale is set (late 19th century) and adopt styles from the music halls of the time, perhaps even with a slight Western-twang. Instead, it’s all very contemporary, pop numbers that just sound so generic and out of place with the grandiose backdrop. What transpires is a very cheesy musical, and while it’s a genre that requires a suspension of disbelief, it’s one that can be so magical and enchanting, and in this instance, it’s just quite cringe-worthy when they break out into song. Particularly the more supposedly poignant moments, where the lead characters almost whisper their lyrics. Then there’s the other key issue, which comes with the troublesome narrative. We need to invent in Barnum’s cause and adhere to his fantasies, but what he is doing all seems rather exploitative. The opening act of the film is effectively about how he grew up poor, and now is desperate for great riches, wanting to provide a life for his wife he could never given himself. So then when he has this revelation to use people who are hairy, obese, tall, short – it feels like he’s using their unique body shapes to make a few dollars. He keeps citing his wish to merely provide entertainment for the masses, but that seems somewhat secondary to his desire to become rich, and in turn, the whole situation doesn’t sit right. It’s okay if the film accuses him of exploitation, but instead it;’s been crafted in such a way where we’re evidently supposed to root for his cause, not question it. On a plus side, and the only things that prevent this title from being a true disaster, is that Jackman is terrific, bringing a wide-eyed sense of optimism that is almost infectious, while the aesthetic is certainly striking, with a Moulin Rouge-esque approach, and a stylistic fervour that ensures that while the content is really flawed, at least it looks quite nice. This entry was posted in Reviews and tagged Biography, Drama, Musical on December 22, 2017 by Stefan Pape.